Ten years ago, Kim testified against her rich stepfather in a local girl’s murder, then left town after his acquittal. 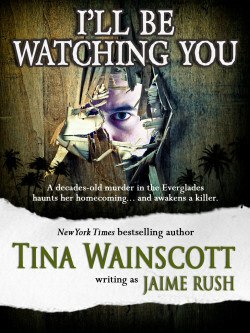 Now, her grandmother’s mysterious death brings her back to her small Everglades town, where they’re happy to show her how unwelcome she is. Kim lifted her head at a familiar sound. She knew what her grandma must have felt at hearing that crunch of shell beneath tire—trepidation. Unannounced visitors weren’t usually good news, that’s what she’d always said. She wasn’t sure what she felt when Zell’s fancy truck pulled into view. Trepidation, sure, until she realized he was probably bringing a copy of the loan agreement. So what was the buzz that felt as though she’d walked into an electric cattle fence? Listening to his music and dreaming about him half the night hadn’t helped either. That reminded her of the iPod, and she went inside to get it. When she reappeared outside, he was unhitching the rear gate of his truck. He wore another colorful, tropical shirt and jeans faded in all the right places. “Thought I’d scared you back into the house,” he said as way of greeting. Not that she expected a cheery good morning out of him. He stared at her for a moment, making her feel self-conscious. Making her wonder what she’d admitted to. No way could he extrapolate that she’d been thinking about him while listening to his music. “Did you enjoy the selection?” he asked at last. Without further explanation, he lifted a large bag from the truck bed and hoisted it over his shoulder, then grabbed up a mesh bag. He walked into the house after leaving the door open for Oscar the pig and letting him enter first. She was left to follow. Why was it that every time she saw Zell, she felt discombobulated? She was chagrinned to admit how much he threw her off. He’d set the brown bag against the wall and was filling one large bowl with water. Then he poured brown pellets from the bag into another bowl, and from the mesh bag dumped out a bunch of toys. Oscar snurfled (that was the word that popped into her head, anyway) everything and then roamed the living room as though he were checking it out to make sure she hadn’t taken anything. One side of his mouth lifted in what was no doubt a smile. “Sure I can. This is Oscar’s home.” He walked on out to his truck, forcing her to follow once again. “You can keep him. I mean, I’d like you to keep him.” She forced a smile even though she wanted to call him a few ugly names for enjoying her discomfort so much. Oh, no, not this again. “Easy,” she said, the word etched in doubt. “A hundred and twenty-five I’d figure. Pigs are smart so don’t start him on any bad habits. Just like people, they pick ’em up fast and don’t shed ’em too easily.” He gave the truck cab a couple of taps with his palm and opened the door. The smirk left his face and was replaced by a melancholy shadow. “She was good people, your grandma.” He got into the truck and pulled away.